Visitors to David Zwirner’s current show of the late, great Gordon Matta-Clark might notice a faint but discernible alcoholic aroma emanating from the sculptural Garbage Wall which bisects the downstairs gallery. This is not due to any seepage from the proliferation of detritus encased in its cement and polymer. Rather it is the residue of what has become a regular ritual which takes place every time Matta-Clark’s widow Jane Crawford and her daughter Jessamyn Fiore recreate the 1970 piece using ‘local refuse’ gathered from the vicinity of each venue. 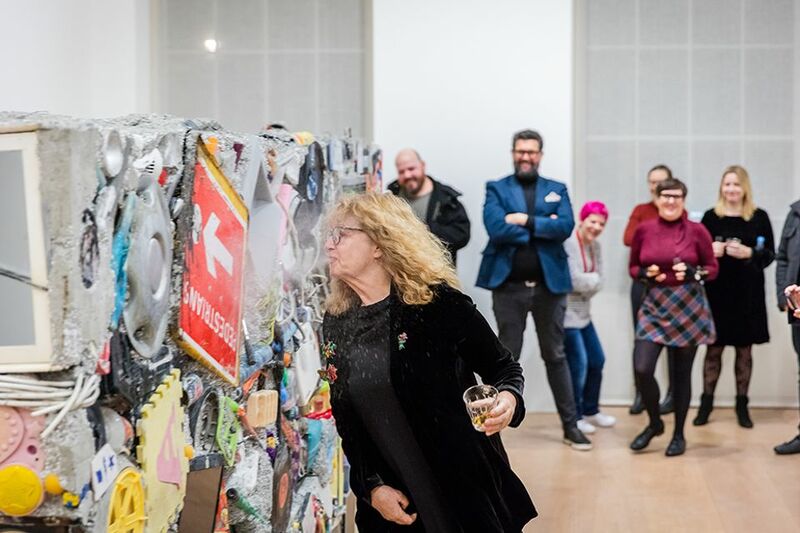 Once each Garbage Wall is completed, and just before the official opening, Crawford walks around the piece taking liberal swigs from a glass of tequila and spraying its surfaces with each mouthful. According to Crawford, this extreme form of libation pays tribute to her late husband (whose drink of choice was Tequila) and also acts as a form of appeasement to all the other kindred spirits who have lived “in joy and sorrow, in love and despair.” The London version was no exception and its local trash received a good liquor soaking just before last week’s opening on 20 November. This London show was an exemplary survey of Matta-Clark’s short but prolific career, encompassing drawings, films and photographs documenting his architectural cuttings-through of buildings and his records of New York’s graffiti. It is also a particularly special one for both the artist’s family and the Zwirner Gallery. For this year marks the 20th anniversary of the gallery’s association with the Matta-Clark estate, which they took on in 1998.